Fighters risk so much in the ring, in life. We mere mortals sit in safety as we watch the brutality unfold, the violently odds on chances of seeing a thunderous knockout far more appealing to most than the mesmerising skills on display. It’s tough for every fighter, even if some of the truly special ones make it look so easy. For a while. But for every Floyd Mayweather, that rare example of a fighter who manages to get out safe, unscathed (by and large) and secure, there are a hundred others – thousands in fact – who stick around too long and pay the price. David Haye may have passed the point of no return. Right now, likely sat alone, the formerly elite fighter is going through it: making the ultimate decision. 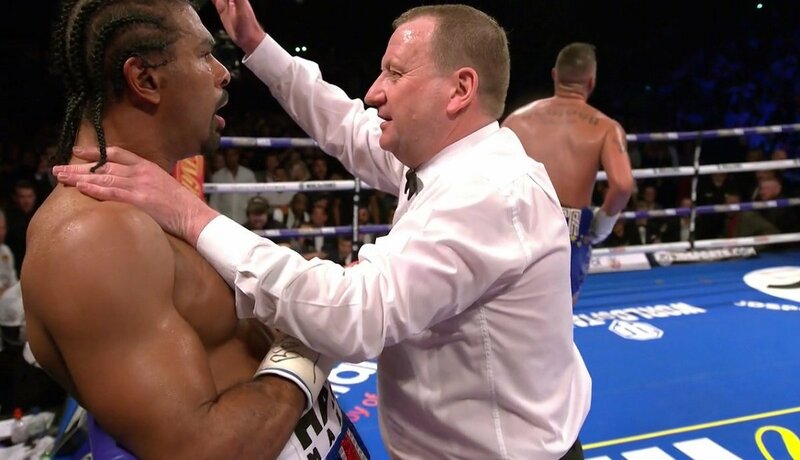 Haye, to the rest of us, faces an obvious and easy decision – retire. But fighters are different. They don’t know, then they do know, then they don’t know. No shot fighter wants to accept he is finished, washed up, done, and the delusion sets in as a result – in far too many cases. Haye will likely chanage his mind a million times; ‘shall I get out or not?’ “I’ll look at the tape (of his crushing rematch loss to Tony Bellew) and see where I went wrong,” Haye said in the ring in London. Those remember how explosive, how dynamic Haye once was, a decade ago, already know where he went wrong: by fighting on after a time he always promised to himself he would retire, hopefully on top as heavyweight champion of the world. But Haye came back after his 31st birthday, after twenty years in the sport. It had been a slow decline ever since. Saturday night’s heavy loss came at nightmarish speed though. All Haye has left is his fighting heart, and it’s a big one. Haye may box on, or try to do so, but he faces huge risk if he doesn’t call it quits. Boxing really is the most unforgiving of sports, and easily the hardest for so many reasons. Fighters have it unimaginably hard from day-one. Throughout their careers fighters face, amongst other things: incredible self discipline, no real social life at such a young age, the knowledge that they could get seriously hurt or even worse, the possibility of being shortchanged by promoters/managers, hating “fans” and critics and then, one day, having to give up what they have done and known for what seems like their whole life. No wonder we mere mortals cannot begin to comprehend a fighter or his mind. No wonder we have no clue what horrors, what torment David Haye is going through right now. Let’s hope he makes a decision on his future he can live with.